I would like to demonstrate a real world web application using Hibernate. Step by step, you can create an application which allows to edit books. This should take you about 15 minutes, if everything runs fine and assuming that you have Maven installed and that you have some experience to deploy a web application to a servlet engine. Maven is a dependency management solution and project build tool. It allows to define libraries which are required by your application. It downloads the libraries and libraries required by those libraries from Maven repositiories on the Internet. It can setup an Eclipse, Netbeans or IntelliJ project. It can package your own projects for production deployment as well. The central Maven repositiories provide nearly all Java Open Source libraries. I would not replace my IDE build during development but it is a great help to manage dependencies and build a project for production deployment. You need an Internet connection and you need to have Maven installed. http://maven.apache.org/ I have used Maven version 3. In a shell input the following command. This needs to be on one line. To have a first look at your application, tell Maven to download the dependencies. Type the following command in a shell. 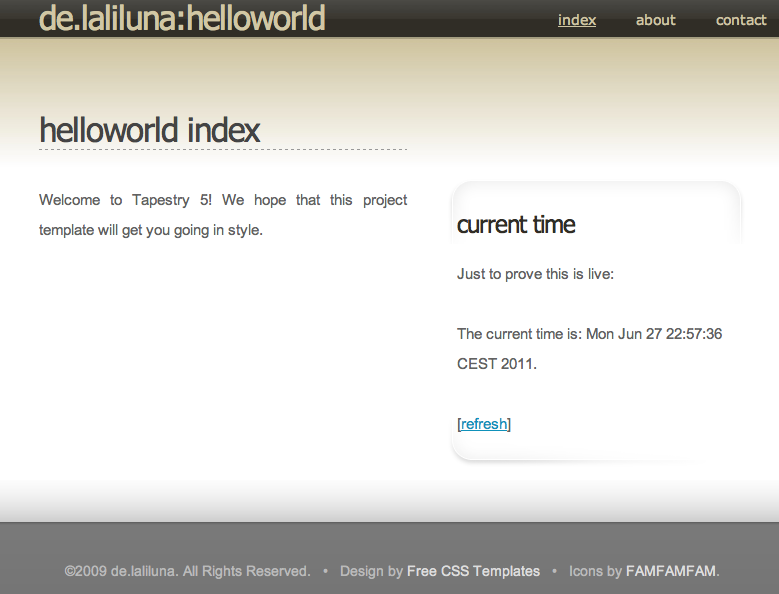 Visit http://localhost:8080/helloworld in your browser. 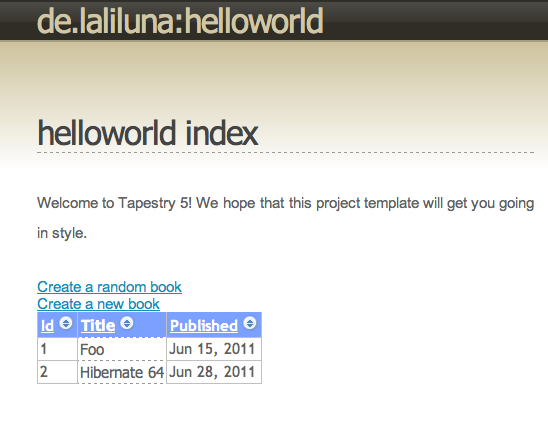 We are going to use the Tapestry Hibernate Module. In addition we need to add the JDBC driver for the database. If you use another database, you need to replace the postgresql dependency. You can find dependencies in Maven repository using search engines. For google use the search term: site:ibiblio.org mysql. Change into the directory helloworld and let Maven resolve the libraries. IntelliJ and Netbeans support Maven out of the box. Eclipse requires the M2Eclipse plugin. Alternatively using Eclipse you may type the following to create normal eclipse project files. Inside of your IDE deploy the project to a webserver like Tomcat or Jetty. In the Index.tml page, we are going to add the grid. Tapestry has a concept of a template and a corresponding Java class. The template can access properties of the Java class. As the grid uses allBooks, we need to add a getAllBooks method to the Index.java class. * Start page of application newapp. Redeploy your application and have a look at your sortable data grid. 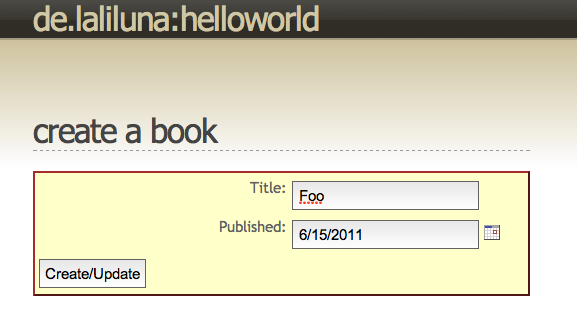 As it is annoying, to have an empty grid, we will add an action link to create random books. An action link calls an action method on the Java class. The corresponding action method in the Index.java file creates a book. Please take care that the method name corresponds to the t:id of the action link. Tapestry uses a lot of conventions like that. As the method returns null, you will stay on the same page. You should be able to create books, see them in the table and sort them by now. Of course, you need to create real books as well and input the data. Create a new template for the dialog. <html t:type="layout" title="Create a book"
The t:beaneditform is a powerful Tapestry component which creates a dialog directly from your model. The model must be provided in the corresponding Java class. In addition, the CreateBook.java class has a onSuccess method being called, when the form is submitted. @Property makes the book available to the EditBook.tml page. Inject a page. It is used later for navigation purpose. * right after themethod was executed. Return the injected page to navigate to the page. Finally, add a link to your index.tml to be able to navigate to the new page. The t:beaneditform component is powerful because it is flexible. You can override each input elements and adapt it to your needs. Let’s add a character LOB to the book and a <textarea> input to the dialog. We need to change the CreateBook.tml to override the description to make use of an textarea. Just check that everything is working. The order of getter and setter in the Book class is relevant for the order of the form properties. You might consider to add the getter and setter of the description field at the end. Alternatively, there is an @Reorder annotation, which allows to define the order in the grid and in the t:beaneditform. In order to open an edit book dialog, we will modify the table displaying all books. Clicking on the book title in the grid, should allow you to edit a book. We need to modify how the title is rendered in the grid, add a new template for the edit dialog and a corresponding Java class with the Hibernate code to update the book. Modify the t:grid component. We override the cell for the title. The grid makes use of a book property to store the current book while iterating. Therefor the corresponding Java class Index.java needs to provide such a property. Add the following code. <html t:type="layout" title="Edit a book"
Create the corresponding Java class. * is required to make Tapestry aware of the page context object. * Otherwise you will loose the information which book was edited. * right after the method was executed. You have completed a first web application using Hibernate. Tapestry provides it own Dependency Injection Framework. It is used internally to deal with the configuration, page and component handling. You can use it for your own code as well or make use of the integration with Spring, Google Guice, or EJB3. Dependency injection inject all what you need into a page. The @Inject annotation in the following code let Tapestry inject a Hibernate Session. Where does the session come from? The Tapestry Hibernate module makes use of distributed configuration supported by Tapestry. When Tapestry starts the module, it builds a Hibernate SessionFactory and registers a factory for the Hibernate session. Whenever you inject a Hibernate session it is created by the factory using the normal sessionFactory.openSession() you have already used in the first example. The module registers a method interceptor as well. It is called whenever the Tapestry Dependency Injection framework finds a @CommitAfter annotation. It is pretty common to let the transaction be handled by dependency injection frameworks. You might have come across the term Aspect Oriented Programming (AOP). Transaction handling is an aspect, which can be provided by method interceptors and there is no need to bloat your code with it. In fact many technologies (EJB, Spring, Google Guice, Pico-Container) makes use of this approach. I hope you got a good impression, how Hibernate can be integrated into a web framework. Component based frameworks are great as you can use and develop powerful reusable components. I can only recommend to try out Tapestry. It is one of the best frameworks, I am aware of. Have you seen the live class reloading of Tapestry? You only need to save a file and reload the page in your browser to see your pages. By the way, you will find a powerful Hibernate integration in the Wicket Framework as well.